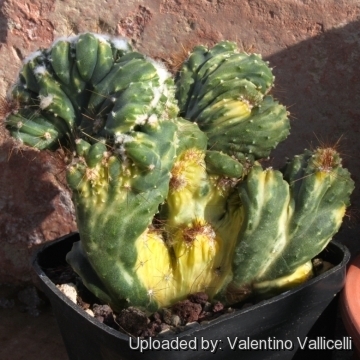 Description: Cereus peruvianus var. 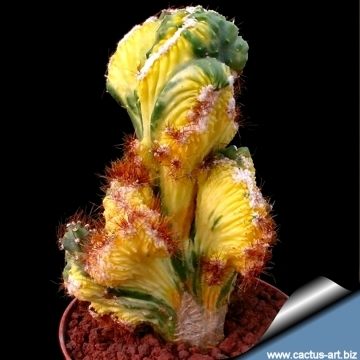 monstruosus f. variegatus is an odd cultivars that produces lots of sculptural monstrous and crested shapes, nicely variegated in yellow of what is normally a columnar cactus. The spines are reddish and very short, while the areoles are filled with white wool. 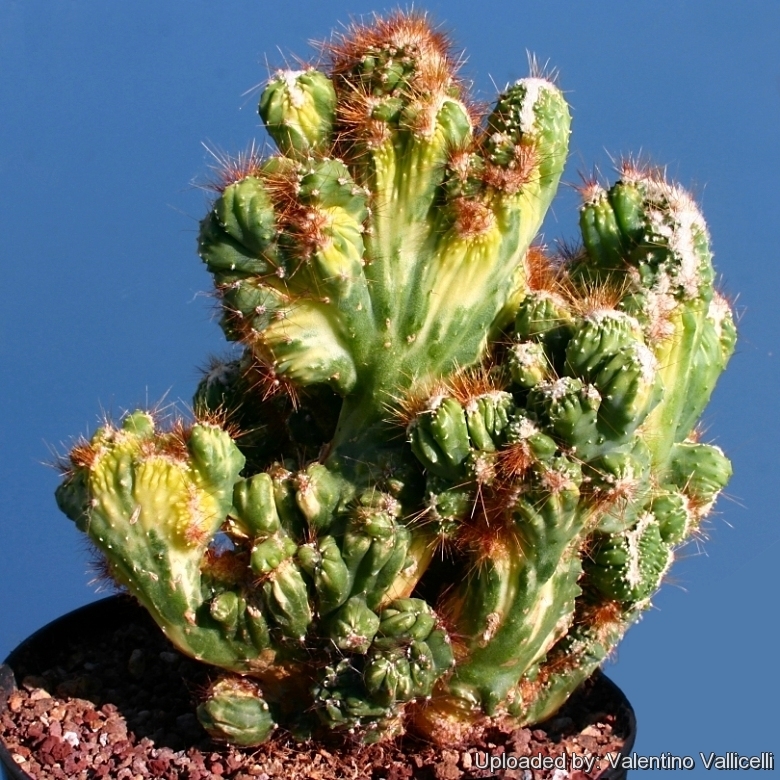 The standard Cereus peruvianus) is quite different looking succulent plant with many upright or slightly curved branches above, often with distinct trunks up to 10 m high. Stems: Variously monstrous, fan shaped or whorled, grey-green to blue-green, 2-6 cm thick growing with time to 50 cm tall by the same width. Ribs: Fairly low, rounded, up to0,3 mm high. Areoles: Small, with greyish-white wool. Spines: Numerous, often absent, needle-like, bristly reddish-brown, and dropping off very early. 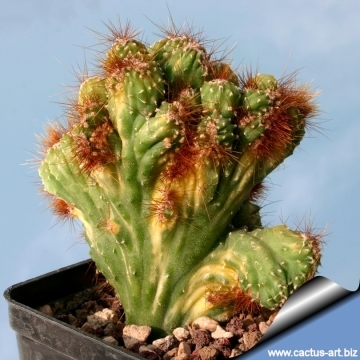 Cultivation and Propagation: Cereus is of easy, the variegated form prefers filtered light. 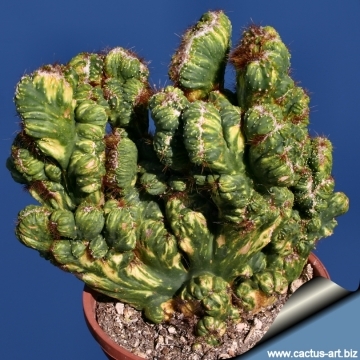 Plant in a porous cactus soil with adequate drainage for best results. Water thoroughly during the growing season when soil is dry to the touch. Less or no water during cold winter months to prevent root loss. It is cold intolerant. Make sure they it is not exposed to freezing temperatures ( Hardy to -2°C) or it may die. Since it is a relatively rapid grower, it needs plenty of space for its roots. 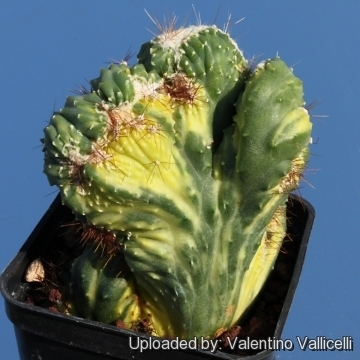 Repotting should be done every other year, or when the plant has outgrown its pot.